Katie Lowes was photographed carrying Tyler Alexandra to the Scandal presentation at PaleyFest in Los Angeles on March 15, 2016. 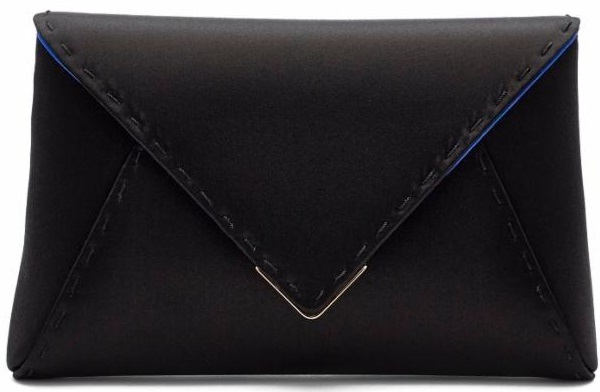 The actress accessorized her look with the brand's celebrity favorite Lee clutch in black satin (price available upon request, www.tyleralexandra.com). Katie Quinn Lowes is an American actress and theater director. She is well known for her role as Quinn Perkins in the ABC political drama series Scandal. Lowes was born in Queens, New York City and graduated from New York University's Tisch School of the Arts with BFA in acting, and later was cast in the stage play Four Saints in Mexico. In 2004, Lowes landed her first screen role in the FX series Rescue Me and later co-starred opposite Marcia Gay Harden in the Showtime pilot, Hate. Lowes later guest starred in the number of television series, including The Sopranos, Without a Trace, NCIS, Ghost Whisperer, Castle, Leverage, and The Closer. In 2008 she starred opposite Laurie Metcalf in The CW short-lived comedy-drama series, Easy Money. In addition to her television performances, Lowes appeared in a number of low-budget films, including The Job, Bear, and Café. Her success continues with other projects as well. In addition to acting, she is obviously fashionable.